We are a group of amateur film makers meeting with like minded people every Monday night at 7.30pm (excluding holidays) endeavouring to make and show the best films we can. We hold many competitions throughout the course of the year and have guest visitors from other clubs. There is a small attendance charge but you will not be charged on your first couple of visits. Should you decide to become a full member, our yearly subscription is only £20. 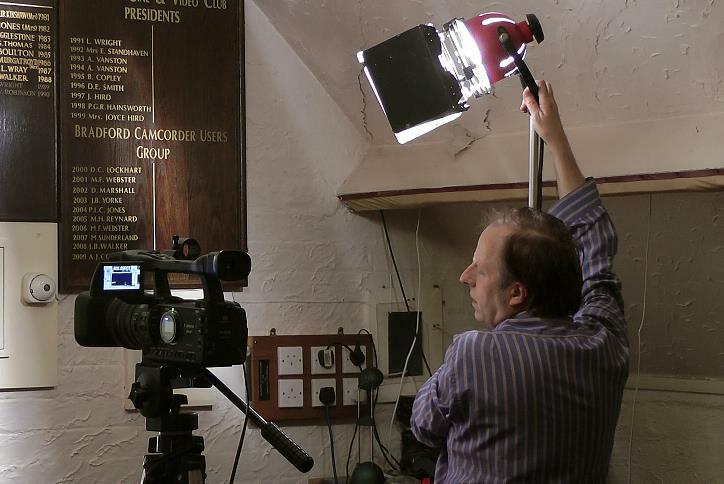 Historically we are one of the oldest amateur film making clubs in the UK. A small group working with black and white 16mm film stock founded the Bradford Cine Circle in 1932. Membership steadily increased over the years with first colour film and then the cheaper Standard 8mm film stock being introduced. In the 1970's Super 8mm and pre-striped film stock together with sound cameras opened up opportunities for producing lip sync. and natural sound effects. This enabled our film makers to experiment with building up better sound tracks and resulted in more polished productions. Unfortunately, the advent of colour television and the rising cost of film stock hit the amateur film world in the late 1980's. Primitive VHS camcorders appeared on the market and were found to compare very unfavourably with film stock. When SVHS and Hi 8 were marketed with an obvious improvement in quality, members became intrigued with these new formats which they were able to view instantly. By 1990 camcorders were being purchased - the club embraced the change and became the Bradford Cine and Video Club. Camcorders improved and editing equipment became more sophisticated - Cine cameras were abandoned. In October 1999 with only one club member using film, the club name was changed to the Bradford Camcorder Users Group later to become Bradford Movie Makers. Today we have an enthusiastic group working on all formats - Editing on many different systems and producing better and better films. Computer editing and digital camcorders can produce outstanding results and members are constantly updating their equipment. We have been in our own private cinema since 1936 with seating for up to sixty and excellent facilities. We are able to project film as well as video.